Limelight Studios is a purpose-built venue for regular or occasional use by various clubs and societies, including our very own popular performing arts school. Limelight Theatre Company offers one-to-one or small classes in drama, singing and vocal coaching. Zelda Rolfe is well known throughout East Anglia for her work in the theatre world, both as a performer and director. With over 20 years teaching and singing experience, vocal coaching and acting, Zelda has helped many young people pursue a career in, or a love for, the arts. The Company stages shows and concerts during the year and runs LAMDA and LCM class exams. Whether you’re an experienced performer or a beginner, and you wish to feel the joy of performing, we’d love to hear from you. Having spent my life working in the Performing Arts industry as a performer, teacher and director, I decided to look for a more permanent ‘home’ and found it in this wonderful Victorian School in Norwich. There are four studio spaces to rent, including a magnificent main hall with lots of original features, mixed with a fresh contemporary feel. Limelight Theatre Company (re-named from ‘Singa-me-jig ‘when we moved to our new premises) has a thriving company of people, some of whom wish to progress through exams to grow and develop into talented young perfomers, a number of our students go onto pursue a career in the Performing Arts industry. Others come to enjoy taking part in all the activities we offer and make friends for life! Tuition is provided for students of all ages, including adults, each week. If you are in either of these categories, please feel welcome to pop in for a visit and find out more. I looking forward to meeting you. We have four studios available for hire. Ranging in size and furnishings, we welcome any kind of classes including: dancing, yoga, martial arts, singing and music lessons or arts and crafts classes. 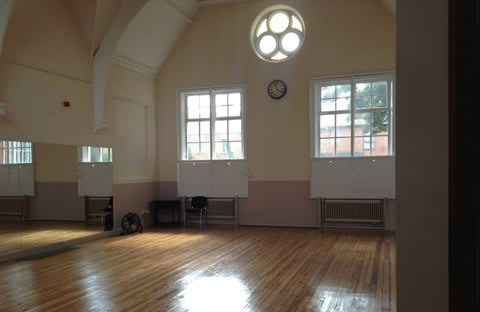 Available by the hour, our reasonably priced studio hire can be for regular classes or as and when required. Call now to check availability.